HAKAINDE Hichilema will be ineligible to contest the 2021 general elections because his term of office as UPND president expires in 2020 and the party should therefore begin looking for a new leader to take over the party, Richwell Siamunene has said. Mr Siamunene who is former Defence Minister said leadership wrangles would soon erupt in the UPND as Mr Hichilema’s term of office expires in 2020 and the party risked disintergrating should the opposition leader attempt to hang on to the presidency of the party. Mr Siamunene said unless Mr Hichilema bulldozed his way, the constitution of the UPND would bar him from running for a third term and that soon calls for his resignation would start which would lead to the disintegration of the party. He said the armageddon Hakainde Hichilema wished for Zambia is now bound to hit the UPND as there shall be serious in-fighting within the opposition party that would result in disintegration and extinction of the once vibrant opposition political party. He said the UPND had been in the opposition for close to 20 years and that there was no hope that the opposition party would form government. He said even if Mr Hichilema would attempt to manipulate the UPND constitution so that it could be amended to allow him to be party president for three terms that would only fuel more outrage from the general membership. According to Mr Siamunene, Mr Hichilema’s term of office would expire in 2020 and that attempts by the UPND leader to cling to the presidency would cause more fractures. “The term of office for Mr Hichilema which has been seven years each ends in 2020 which means that he will not be eligible to contest the presidency in 2021. 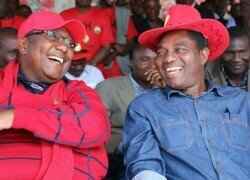 My advice is that life does not begin and end with politics and Mr Hichilema would be very useful in another capacity. Let him chart another route in his life because politics has failed him,” Mr Siamunene said. Mr Siamunene, who is Sinazongwe Patriotic Front (PF) losing parliamentary candidate, has predicted that the UPND would soon remain a shell of its former self as there shall be mass defections to the ruling party after the petition is disposed of in the Constitutional Court. Mr Siamunene said in an interview yesterday that he was happy that he had moved from the UPND because he knew the opposition political party was never going to form government. He said Hakainde Hichilema should consider embarking on a different course of his life because his ambitions to take up the leadership of the country had permanently collapsed with his fifth defeat at the presidency. Mr Siamunene said soon after the petition, the UPND cracks would considerably widen as some senior leaders would start calling for the change of the top leadership because Mr Hichilema had been unable to deliver the opposition party into government. He said the general membership and some senior leaders had become disgruntled and were not ready to continue being in the opposition and would soon be flocking to the PF.